Upstairs in the bedroom, following a dizzying shower, those words filled the space between the midwife and me. Down below, in the dead of night, my husband cradled our new baby in his arms. Flappy-footed, spindly-legged, wide-eyed and alien-faced, this newly landed creature mesmerized from first sight. Earlier, held captive by his beautiful face, I’d briefly wondered how those legs would ever hold him. 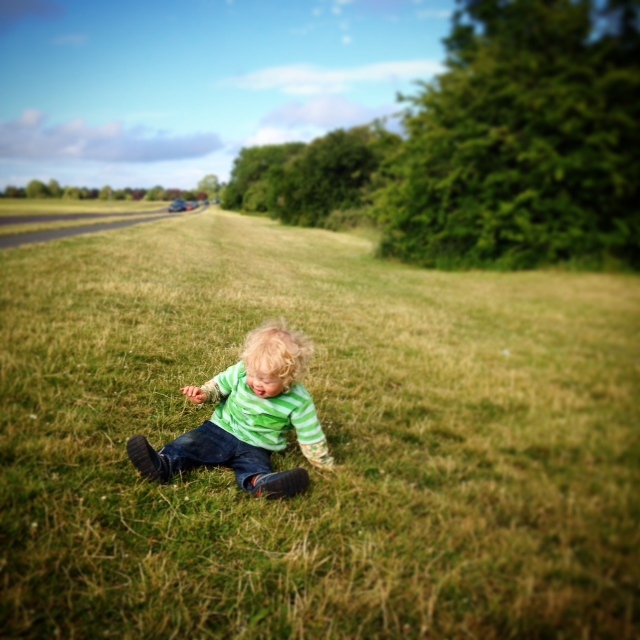 Our son—an unexpected delight who arrived just two months after I turned forty-one. Declining all but a dating scan, I waited to welcome whomever had the tenacity to turn up forty weeks after contraception failure and a miscalculation of ovulation dates had me scurrying to the doctor like a sheepish teenager. Knowing people who struggled to conceive or suffered the misery of miscarriage, I felt blessed that I had fallen so easily. Whoever was coming our way was here to stay, and information from an ultrasound wasn’t going to change that; this unborn child was already family. Love struck, I calmly drank in the upward turn of his eyes, the stubby hands with the pointed pinkie fingernails—a throwback to ones I had tended as a student nurse. The odds were one in a hundred—99% unlikely to happen—but the presence of an extra chromosome was written all over his body. I held this secret discovery close to my chest. In the hush of the living room, our daughter looked on as every last fiber of placenta was examined. The cord, instead of rooted deep in the belly of this tree of life, was a loose-limbed branch barely clinging to the extremity; the connection of this knotted cable, this rope of existence, could have been severed at any moment. He’s special. He’s meant to be here, said the midwife. I didn’t realize that she was letting me know that she, too, knew the truth about my son’s hidden extra. In the bedroom, she said, “It’s okay to grieve for the baby you didn’t have,” but I hadn’t been expecting any particular child. With no imaginary baby forming in my mind for nine months, nothing was lost. There had been no mourning sickness. “He might take longer to reach his milestones,” she said. The pediatrician worries that our son might fall far behind—that he will never bridge the widening gap, a legacy borne of living in a world of diagnosis and dread. We see a different picture, know that the only gap to bridge is a sea change into a world that sees beyond the shape and form of him to the human heart within. Since birth, our son has been growing his own way; an ordinary unfolding guided by the innate intelligence that resides within all life. Once mole-like, his eyes soon lit up beneath a solitary arched brow as he examined his steepled fingers; upstanding for the morning sermon. He babbled on, speaking fluently in a tongue we could not understand but which seemed to make sense with inflections and pauses in all the right places. Belly down, head up, arching as a bow. Arms outstretched, he looked like a skydiver falling in free flow. Nothing could deter him from moving forward, from discovering his edges and what lies beyond. The physiotherapist puts a basket of blocks on a low table to entice him to stand on his own two feet. Another block box sits upon a stool. The idea is that my son will hover betwixt and between, freestanding, then walking. We do not do these exercises at home. He has his own way of achieving the same end, does so of his own volition, no gimmicks or enthusiastic encouragement required. When home, he pushes dining table chairs along like a miniature furniture removal man. Straddling stool and piano, he stretches up to tickle the ivories in a gentle, melodic manner simply because he loves experimenting with sound. His body wisdom, preparing him for independent travel, knows that this will lead to stronger legs. These movements have purpose. In trying to reach some tantalizing object or eye-catching place, an inner impetus propels him. He is growing from the inside out; behavior follows thought. This insightful unfolding must impact his development. In my experience, learning that has come from quenching my thirst is never lost to me. Standing at the helm of his own earth ship, my son knows his power. Rather than reaching some unmoving target, what matters is having the freedom and space to respond to this inner drive. This instead of pushing towards, and forever never measuring up to, a developmental pattern he wasn’t designed for. We see beyond the shape and form of him to the genius potential within. Nearing the point of ripe readiness, my seven-year-old is on the verge of reading by making out short words. Surrounded, as he is, by language and storytelling and a love of books, his desire to decipher the mysterious black patterns is a given. With a drive to master his own physicality, it is inevitable that my two-year-old will walk. He is right on target, steered by the same spirit that makes grass grow, flowers bloom, and the earth turn. Though they may need kind words and a gentle hand to hold when the path of life gets a little tricky to navigate, the way is already known to them. I watch my son, grin planted on his face, arms up, hands fist-balled at his shoulders. He readies himself on his unsteady legs and launches free of the chair’s safety net. He lurches forward, staggering like a drunk and takes a few steps. He catches my eye and claps himself. I can’t help myself. I join his celebration and clap along with glee. Maybe milestones do matter after all. This story was originally published at Mothers Always Write, a beautiful online magazine full of heart warming stories and poems written by mother writers.